As the trail of blood and honor gets deeper and longer, corruption and double crossings abound. Two considerably evil and ambitious forces, previously teamed to finally kill the vengeful samurai Ogami Itto, clash in the torrential rains that continue to pound Edo. 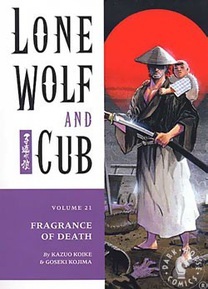 Determined to be the first to reach Ogami Itto and his son Diagoro, the shogun's own poisoner waits in a temple where the samurai and his toddler boy left their cart, reflecting on the path that has led him to this point, and brewing his most deadly poison. And the fiery Retsudo won't be stopped in his quest to kill Ogami, however now he must be wary of the poisoner's crafty ways. Meanwhile, the Lone Wolf and Cub enlist the aid of a tailor to help them prepare for what could be their last stand! There's something in the air, and it smells like death!